How did the market begin? 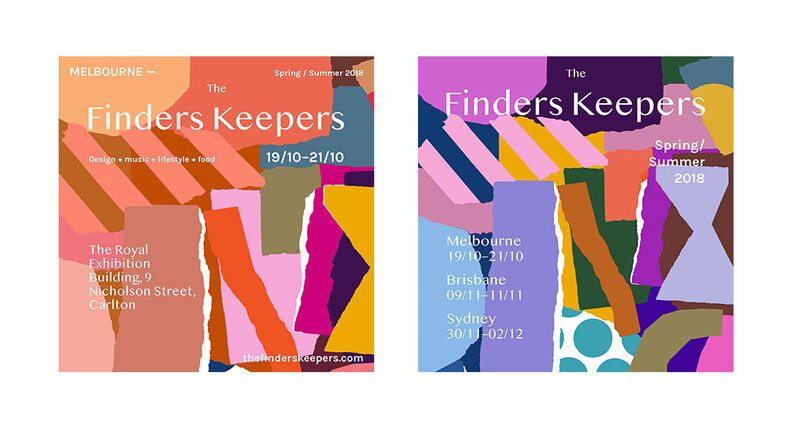 The Finders Keepers was founded in the summer of 2008 in Sydney, by young designers and friends, Brooke Johnston and Sarah Thornton. The markets quickly expanded to Brisbane in 2009, with Melbourne hosting their first event in 2010. Brooke and Sarah are designers themselves, so their aim was to create an event to fulfill a gap in the marketplace. They wanted this to reflect their own styles and do it with like minded creatives. So, with an opportunity to create an event in an empty space, an amazing blank canvas, with little to no budget their market was born. Very humble beginnings. Their vision encompassed an environment they would personally enjoy shopping within; combining everything they loved under one roof. The ethos for the market is simple; to create a supportive environment for like-minded, independent designers to sell their work. Each year the events have grown substantially, with Brooke and Sarah gaining loads of know-how and applying their newfound wisdom to produce bigger and better events. From managing the full magnitude of business tasks between them, to forging a flourishing company that now employs eight people in addition to a passionate and hard-working events team based across each city; the best is yet to come. What’s the best advice you can give to someone, looking to launch a creative start up? Start small! The markets were a small enterprise that started while the two founders had full time jobs. It grew it organically over time and they started to drop to PT jobs and then successfully dropped them all together, but it took time. The beauty in small progressive steps is you get to learn the ropes as you grow, listen to your customers, learn from your initial mistakes, pivot and get clear on your direction. Listen to your intuition as you can get confused with messages from people telling you what you should / shouldn’t be doing. One of our mistakes was trusting too much of what other people advised instead of having a healthy dose of our own discretion and first hand experience. Test the market. Stay unique with your product or offering and make sure its serves a purpose, that people actually want / need it in your life. Don’t wait until you’re ready, jump in and get it happening as you might just hit the right niche at the right time. Tell us, what does a day in the life of the Finders Keepers office look like? Everyday is pretty different in FK land which keeps it really interesting! Working on our events means we’re working on six large scale projects at a time. It’s curating, meetings, bookings, creating content, copy writing, strategising, phone calls, laughs, cups of tea and lots of love. We’re a pretty casual lot. Some of us work part-time at home, managing families and some of us are full time at HQ. We’re a strong diverse team of amazing women. Each season the furniture selections are curated to complement the market’s branding. How do you go about approaching collaborators, for your event artwork? Sarah: “This is one of my favourite parts of the job, we’re always looking at artists and illustrators we can work with ahead of each season. As we have so much talent at our fingertips it’s not too hard to find someone”. Each season the Directors sit down and think of a new theme that works with the artist we’ve chosen and any highlights we want for the seasonal campaign, whether its colours or current trends. We try and keep it diverse and interesting so it’s a new delightful experience for our customers. This season’s artworks were produced by the talented Leah Bartholomew. What’s next for The Finders Keepers? We’re looking forward to unveiling some new exciting aspects of the business next year, which include more within the online realm and more community based projects that connect with our makers and the wider community. Watch this space! 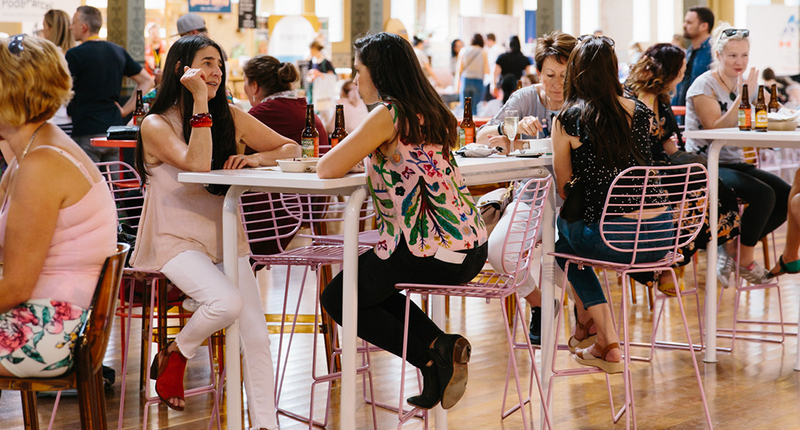 Which Finders Keepers has the most attendees between Sydney, Melbourne and Brisbane? Melbourne holds the record for the largest attended Finders Keepers ever! As well as hosting the most stalls. 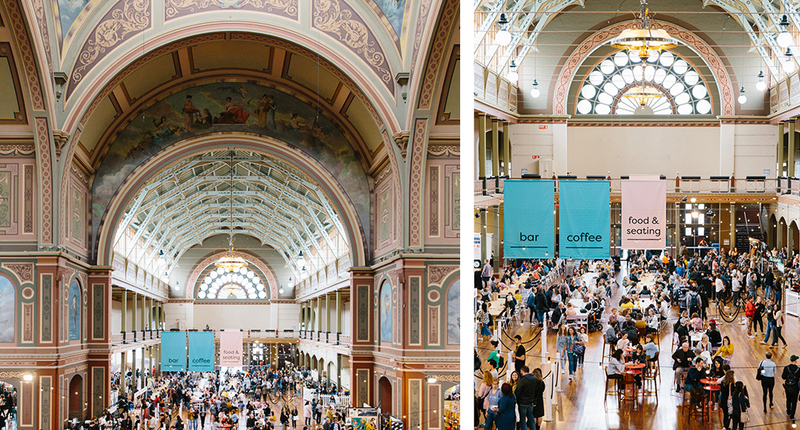 Overall, how many patrons attend the market at the stunning Royal Exhibition Building? 30, 000 – 40,000 visit our Melbourne markets. How many Finders Keepers crew does it take to setup the Market, at The Royal Exhibition Building? We have a core crew of ten people and ten event casuals at each event; in conjunction with sound and lighting, bar and music crew, security, cleaners and installation crew. It’s a jam packed day full of hi-vis vests! You have several stallholder categories; how many stalls do you reserve for debut designers? We have forty debut designers and we consistently hit a ratio of roughly 30% of ‘new to FK designers’ at each event. We then rotate designers based on category, popularity and attendance across other events, keeping it exciting and different for our customers. 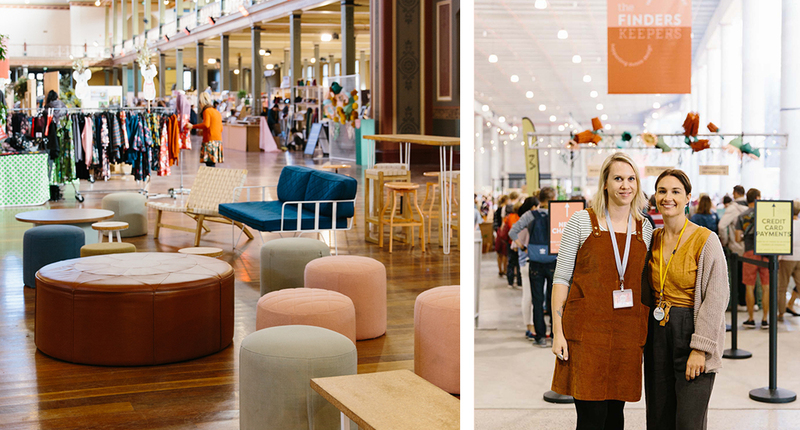 How many pieces of furniture were provided, for the Melbourne market? The Market set up requires over 500 pieces across all areas of the event; from lounging, cafe to outdoor items. We love the breadth of your range and collections. Which Dann Event Hire piece do you resonate with the most? Many people don’t know that our little HQ is actually based in the beautiful Northern Rivers. The Bamboo Wingback armchair is so Byron right now. I’m pretty sure everyone in our team would love to own one! !